I can’t believe that it’s been almost four years ago when I first made this cake. 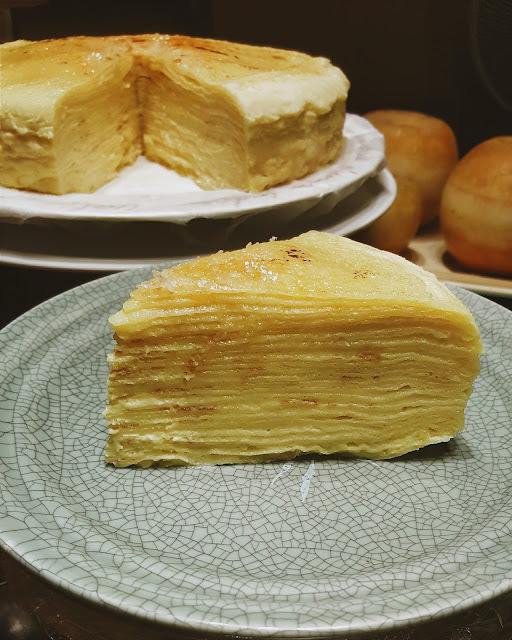 It took one episode of Best Thing I Ever Ate to remind me of this elegant dessert which is a stack of paper-thin crepes alternating with pastry cream which also serves as the binder and turns it into a cake. You know how tedious it is to make the crepes and I only have one 10” pan so no way I can make two at the same time. 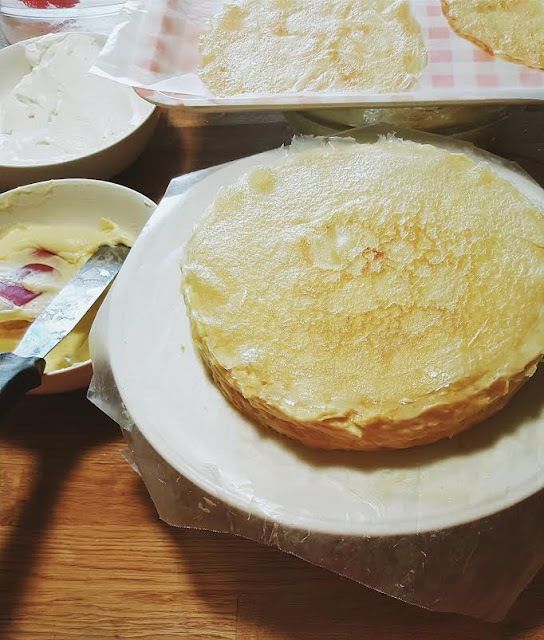 Anyway, I prepared the pastry cream and whipped cream filling first before I started making the crepes although the batter was made the day before. Making the batter early works for me as it needs to chill in the fridge for a few hours; much better if overnight because it helps the crepes from breaking as they are cooked. In a separate small pan, warm the milk until steaming; remove from heat and set aside to allow to cool slightly. Mix together the eggs, flour, sugar, and salt in another bowl. Slowly add in the warm milk and browned butter. Pour the batter into a tightly-sealed container to refrigerate for several hours or overnight. In a medium saucepan over medium-high heat, whisk the half-and-half, sugar, cornstarch and a pinch of salt until it comes to a boil. In a medium bowl, whisk the egg yolks, then slowly whisk in half of the hot mixture. Pour the custard back into the pan and cook, whisking, until it comes to a boil. 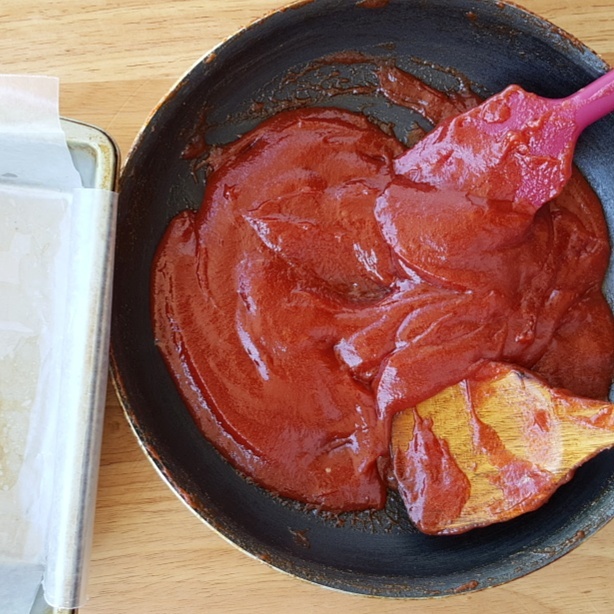 Stir in vanilla extract and transfer to another bowl and cover with saran wrap- refrigerate for an hour or overnight for best results. To assemble the cake: Lay 1 crepe on a cake plate. Using an icing spatula, completely cover with a thin layer of pastry cream (about 1/4 cup). Cover with another crepe and repeat to make a stack of 20, with the best-looking crepe on top. Chill for at least 2 hours. Set out for 30 minutes before serving. If you have a blowtorch for creme brulee, sprinkle the top crepe with 2 tablespoons sugar and caramelize with the torch; otherwise, dust with confectioners’ sugar. Slice like a cake. 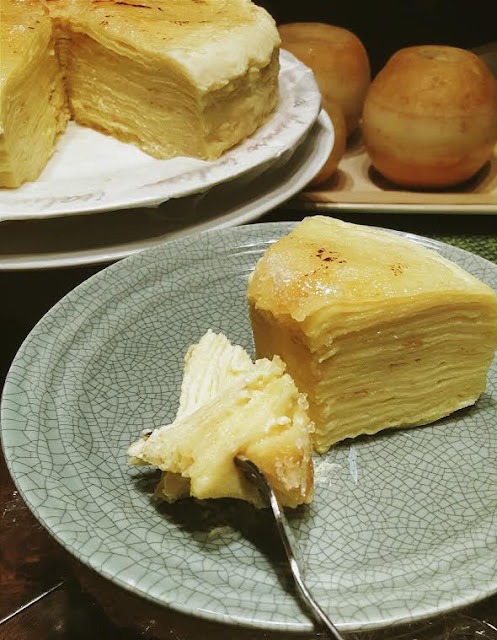 Notes: I increased the ingredients by half (crepe batter; pastry and whipped cream filling) so I came up with 20+ crepes and still have leftover filling). I assembled the cake while still making the crepes. 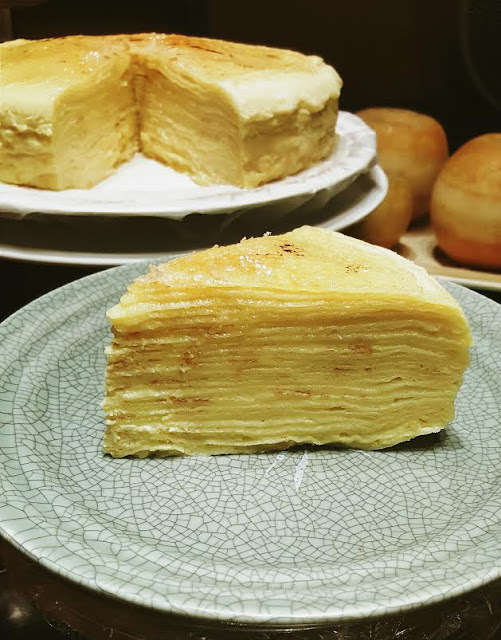 Before, I would stack the crepes on top of each other lined with wax paper. This yielded a better texture in terms of moisture. The cake came out really tender and moist. You can check my previous post for more pictures.